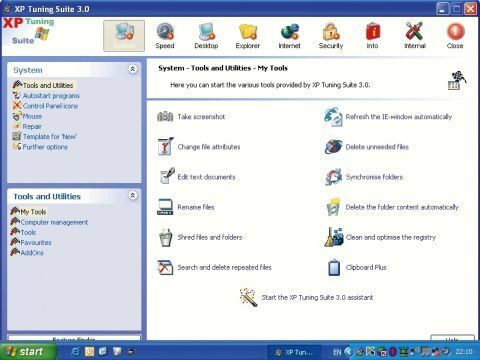 When we first saw that XP Tuning Suite 3.0 offered over 600 options for fine tuning your XP-based system, we didn't know whether this was a good or bad thing. It sounds comprehensive, but we wondered how the average user would be able to make sense of it all. Luckily, another promise of a 'smart non-technical interface' made us feel a little better. It turns out that the 'smart' part of the interface is a small, animated wizard who pops up blowing some kind of bugle to get attention. We thought everyone had learnt a valuable lesson from the demise of Clippy, the animated paper clip from Microsoft Office 97. Not Data Becker, it seems. It's resurrected a technology even Microsoft wants to bury. At least you can turn him off. Of more practical use are system recovery points that save a snapshot of your system before you make any potentially damaging changes. This is configured from the first run, and will enable you to revert to a working configuration should the worst happen. XP Tuning Suite enables you to get to many of the behind-the-scenes Windows settings that Microsoft keeps hidden for one reason or another. Some of these can genuinely make a difference, while others are the computing equivalent of a placebo - just the act of changing your configuration makes you feel better. When first launched, the tuning assistant window helps you to change all the main settings in one go. It promises to accelerate system shutdown and network access, along with the usual options of optimising the system cache. These are all changes you can make yourself by editing the right system configuration files. A further page of options enables you to disable the usual suspects when it comes to your online privacy. Windows updates can be disabled (probably not a good idea), and you can finally disable MSN Messenger starting automatically. The main application gives you an alternative way of accessing the same set of options, along with a few additions. Each option is grouped by subject, such as Speed, System and Desktop, and additions include the stuff you can fi nd in the various Windows Control Panels. There's also an applet that sits in the toolbar near your system clock. From here you can launch the main application, as well as perform a couple of other tasks like block popups and use custom bookmarks. A worrying entry promises to delete all your Internet history, when in fact it will only delete the cookies, cache, history and temporary fi les that Internet Explorer uses, rather than catering for other browsers at the same time. Overall, this is a mixed bag. There are plenty of options, but we couldn't find any that were unique. Even the touted Windows licence backup can be performed manually if you know what you're doing. Despite the low price, it's difficult to recommend when you can get nearly the same functionality from some judicious Internet searches, and a little bit of work. There's also the problem of direct competition. TuneUp Utilities 2006, which we looked at in PCA157, does a much better job of packaging an almost identical toolset.